Constitutive and hormone-mediated signaling of the ghrelin receptor in relation to the dynamic pattern of ghrelin secretion. (A) Variations in plasma ghrelin concentration (conc.) depicted as a dynamic range in relation to a meal. Note the pre-meal surge in ghrelin secretion followed by inhibition related to the presence of food in the upper gastrointestinal tract. Illustration based on work of Cummings and coworkers (12, 13). (B) Illustration of the almost 50% constitutive, ligand-independent signaling of the ghrelin receptor as measured, for example, in inositol phosphate accumulation assays and the agonist response mediated by the ghrelin hormone (4). 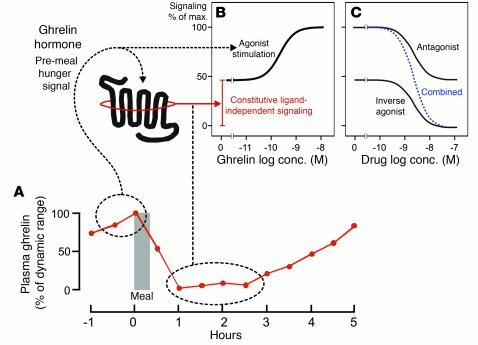 To the upper left is indicated that the high constitutive ghrelin receptor signaling is expected to be dominant in the inter-meal period, while the ghrelin-mediated signaling is most important in the fasting state and pre-meal situation (10). (C) Diagram of the theoretical effect of an inverse agonist, which inhibits constitutive signaling; the effect of a pure antagonist, which blocks the agonist-mediated signaling without affecting the constitutive signaling; and the effect of a combined antagonist and inverse agonist (dotted curve in blue), which blocks both the agonist-induced signaling and the constitutive signaling. It should be noted that for 7TM receptors in general, antagonists generally also act as inverse agonists, a phenomenon whose salience depends on the receptor displaying a reasonable degree of constitutive signaling. However, compounds have been described — for example, in the ghrelin receptor system — that are significantly more potent as inverse agonists than as antagonists (4).